busmatt, mkws and ZM-73 like this. mkws, busmatt, Dan S and 7 others like this. Starting the month with my favourite (and only) ultra-thin automatic. This Anker that I got at the weekend now has a more complementary band and looks like a billion dollars (inflation!). The strap that came with it still very interesting. Has anyone any ideas about the crown-adorned enamelled panels on this strap? mkws, busmatt, Dan S and 5 others like this. my favourite Diver.. even a vintage Submariner couldn't take its place on my wrist. Last edited by mit.uhr; 2 Weeks Ago at 18:16.
mkws, rokoce, busmatt and 5 others like this. rokoce, Border-Reiver, busmatt and 11 others like this. (...)but that's what mankind is like: they only prize what they no longer possess. For any inquiries regarding vintage Doxa watches, please read the highlighted text in my vintage Doxa thread. Sorry, but I will not respond to PMs on the matter. I can hardly believe it, but this is my first acquisition of 2019. I've had good discipline this year, selling several watches, and this one was a trade. It is a Seamaster 300 ref 165.014-63. 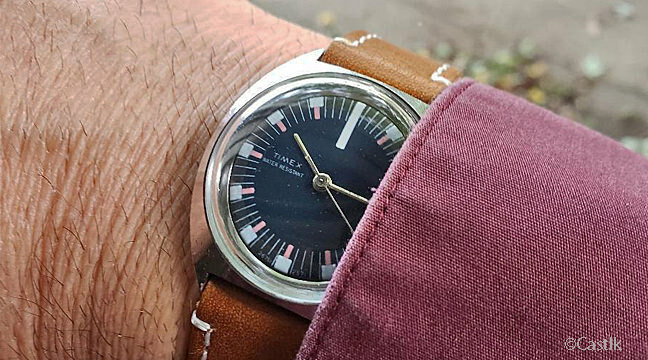 The Bakelite bezel inlay has totally degraded, which is extremely common with this reference ... so much so, that the watch in this configuration has been given the nickname "Kojak". I will wear it like this for a while, but there is someone in Italy who restores these inlays if I choose to do so ... although I hear it's a very long wait. Border-Reiver, James A, bubba48 and 8 others like this. Dan S, mkws, Old_Tractor and 10 others like this. Old_Tractor, mkws, James A and 5 others like this. My Park Lane Sears brand powered by a Sears & Roebuck marked AS 17 jewel automatic. mkws, Dan S, James A and 5 others like this.